Hinge Ultra Cuffs employ innovative technologies that are available only from ASP. They provide exclusive features that increase both performance and safety. 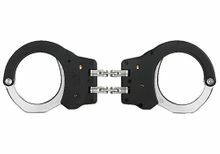 The steel model of the Ultra Cuff weighs only 9 ounces while the aluminum is just 7 ounces. Both are full featured restraints that were specifically designed to �Lighten the Load� of an officer or agent.